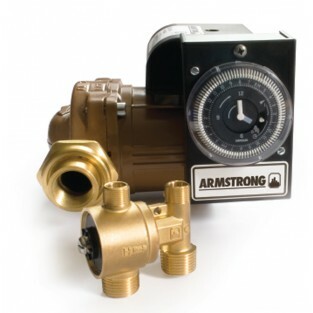 The Armstrong Astro Express 110223-401 system delivers hot water to the tap, recirculating cooled water back to the water heater via existing cold water piping. In addition to providing the homeowner instant hot water access, the system also helps to conserve municipal drinking water resources and save metered water charges. It's easy to install and does not require special return piping to the water heater. This makes the Armstrong Astro Express system the ideal retrofit solution for existing residential buildings and a cost-effective solution for new housing construction. Astro 20 SSU w/timer & 6 ft. Line cord, union hardware kit, Astro Express LF Valve. HARDWARE KIT Includes two gaskets, union nuts, 3/4" FPT tailpieces, and one 3/4" MPT tailpiece. Hoses for valve connection not included. 15 minute user selectable intervals. On/Off/Auto switch_ 120Vac, 1/25 HP, .5A.